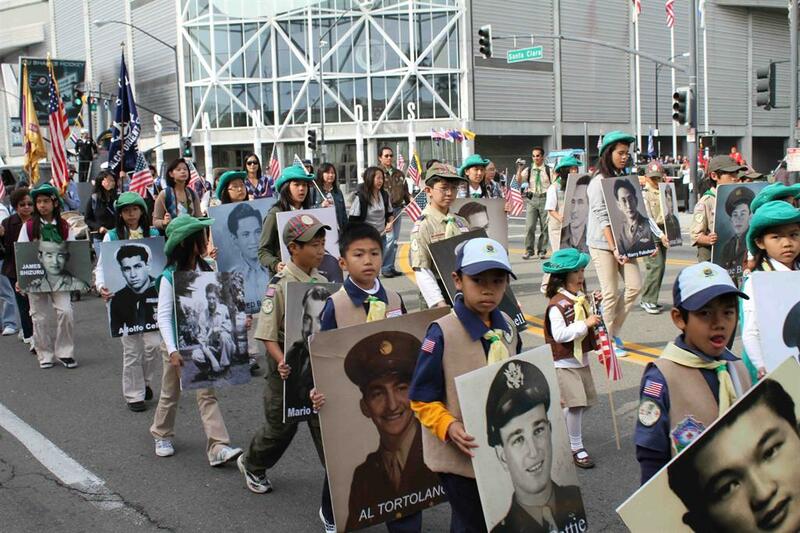 Girl Scouts of America have a proud WWII heritage. 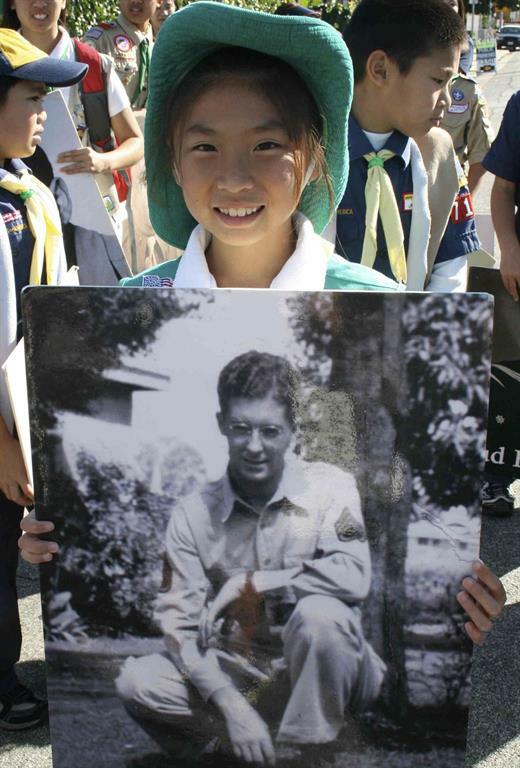 Scouts helped sell war bonds, tend Victory Gardens, and collected metals and other materials to be reused. 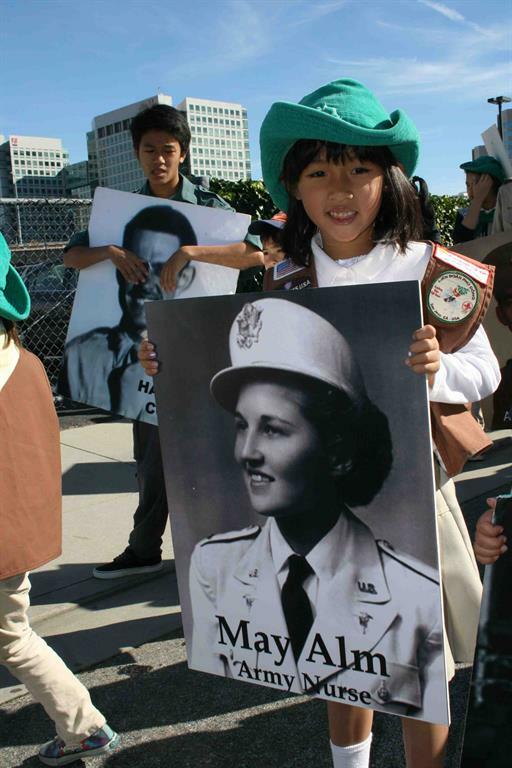 During the war, Girl Scouts collected 1.5 million items of clothing for war refugees. 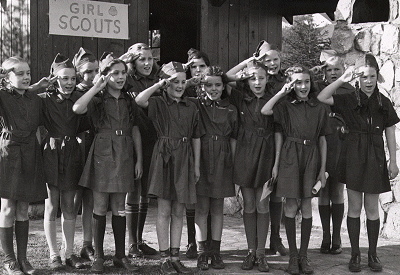 Girl Scouts also formed “Defense Institutes” for teaching women necessary skills and ways to comfort children during possible air raids. 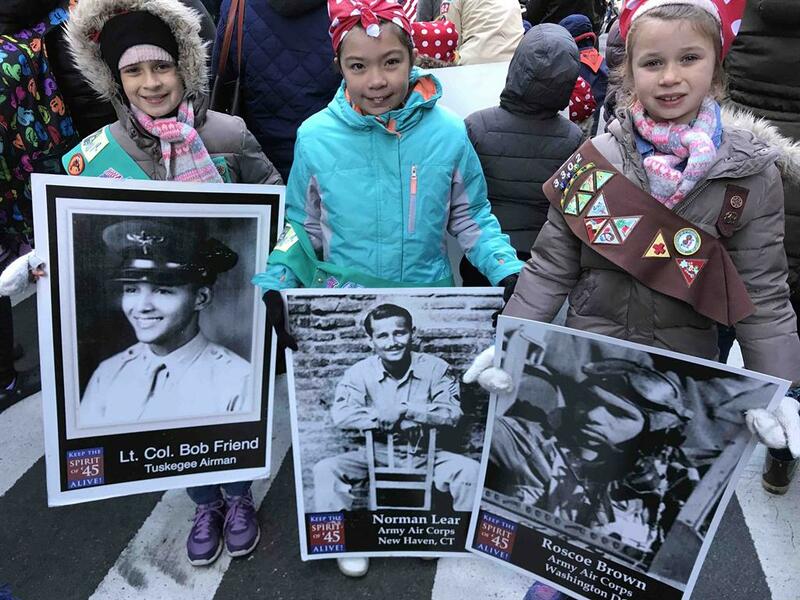 Troops made calendars instead of the Girl Scout cookies, so they could help with food rationing when sugar and flour were in short supply. 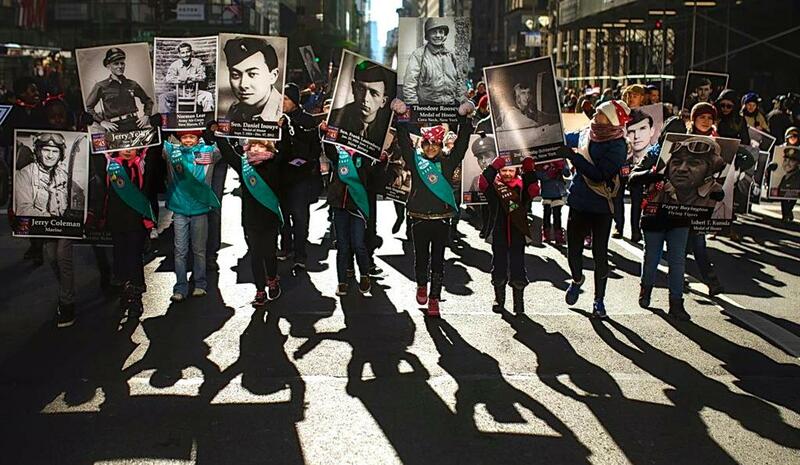 In New York City, for example, the Girl Scouts registered 10,000 members for “victory service” by setting up bureaus strategically spread across the city. 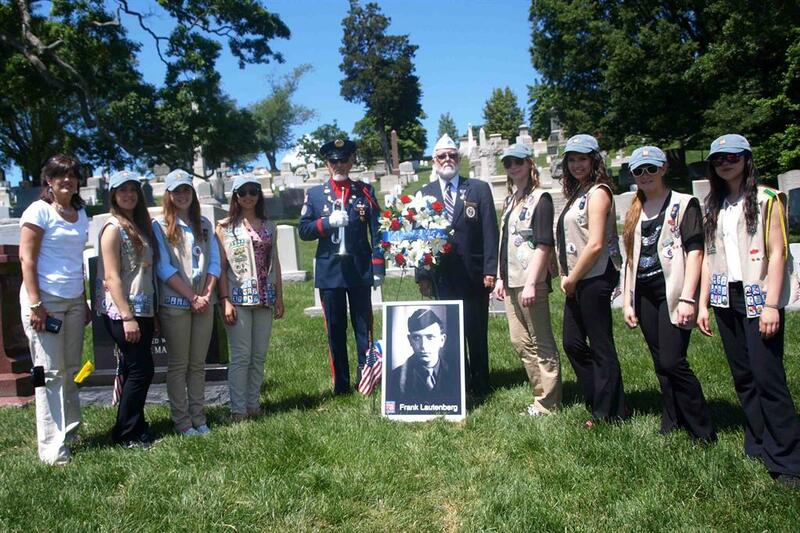 Scouts provided medical assistance to the Office of Civilian Defense, the Red Cross, local hospitals and others in connection to the war effort. 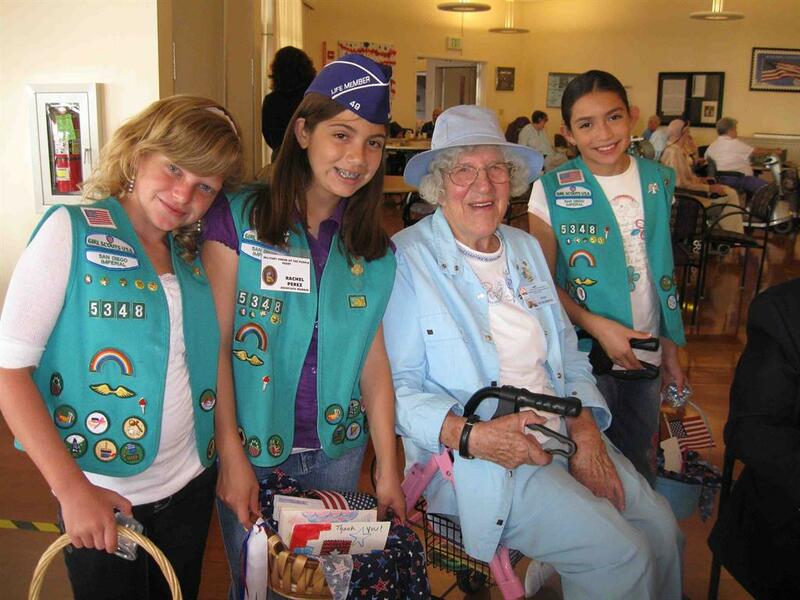 In 1942, the Girl Scouts started a hospital aide program for senior girls. 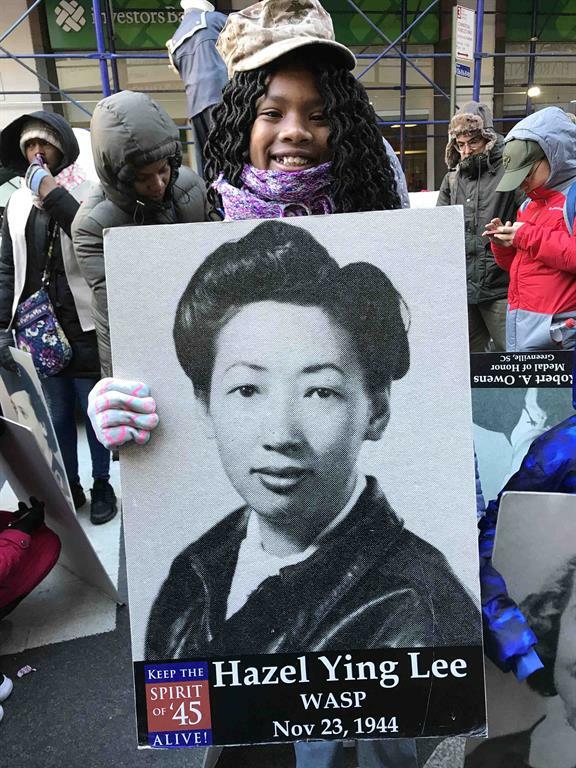 High schoolers were trained to help with feeding patients, performing clerical work, serving as messengers, preparing supplies and equipment, and making beds. 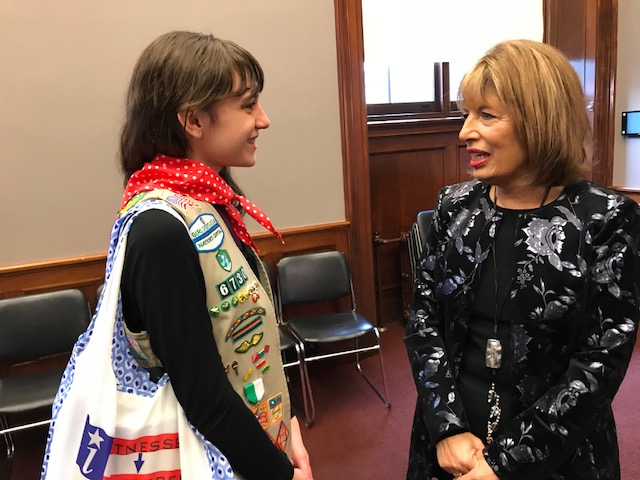 No official uniform was provided, but many girls made smocks of green-and-white striped cloth, or wore white smocks over their Girl Scout uniforms. 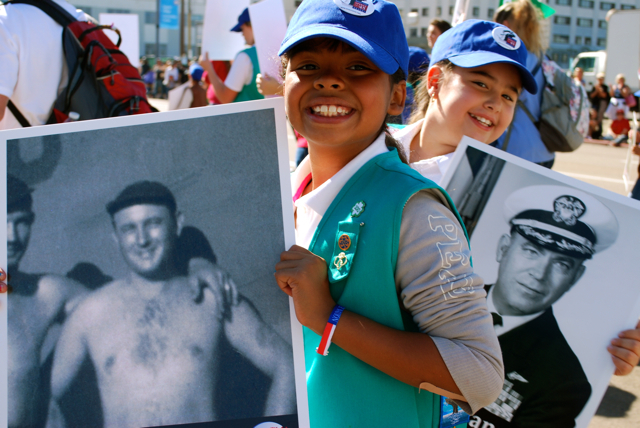 To honor the Girl Scouts, a Liberty ship was named for the organization’s founder. 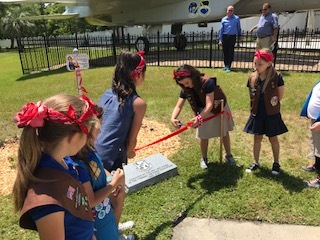 The S.S. Juliette Low was launched on May 12, 1944 at the Southeastern Ship Yards in Savannah, Georgia, Juliette Gordon Low’s hometown. 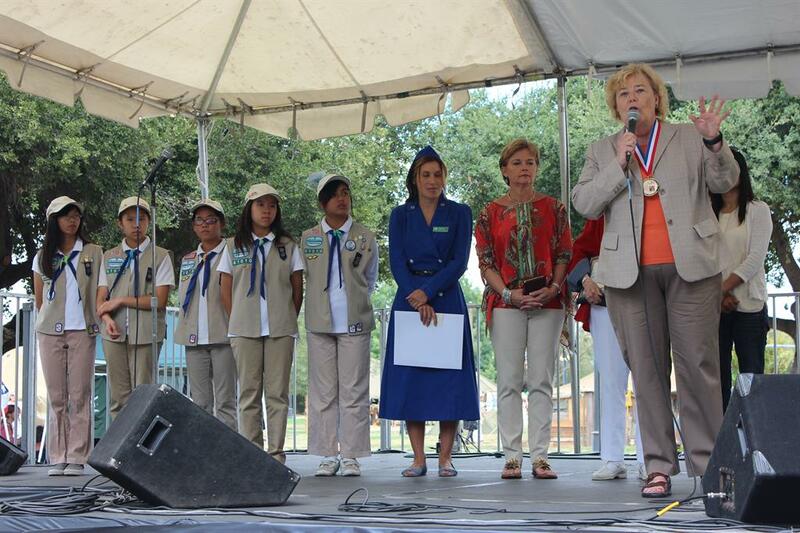 The ship was christened by Margaret Gordon, the first Girl Scout and Juliette Gordon Low’s niece. 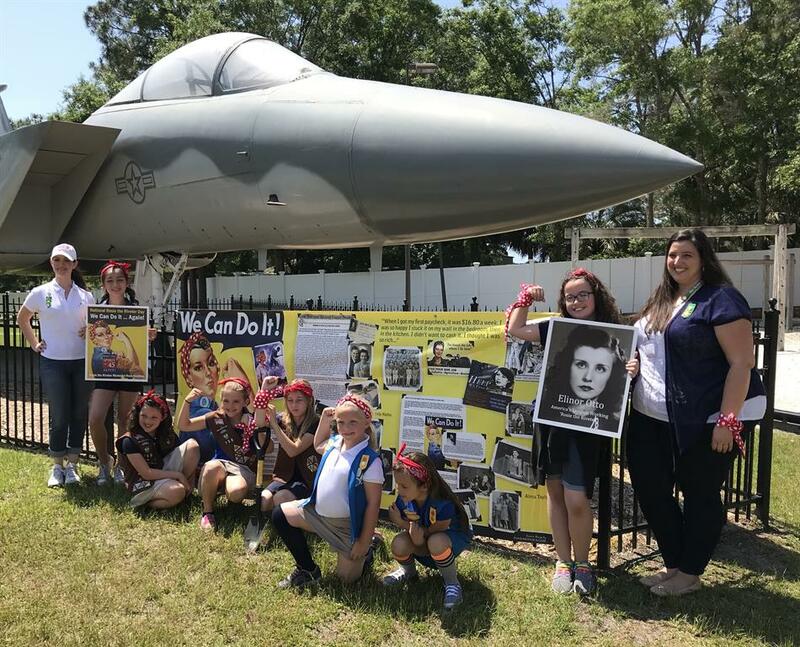 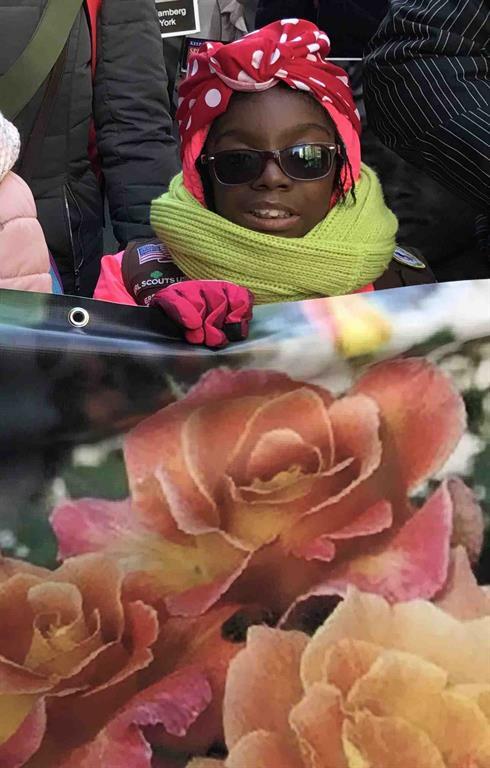 Girl Scout troops have participated in the Keep the Spirit of '45 Alive campaign since its earliest days and are now participating in the national Rosie the Riveter Rose Gardens campaign. 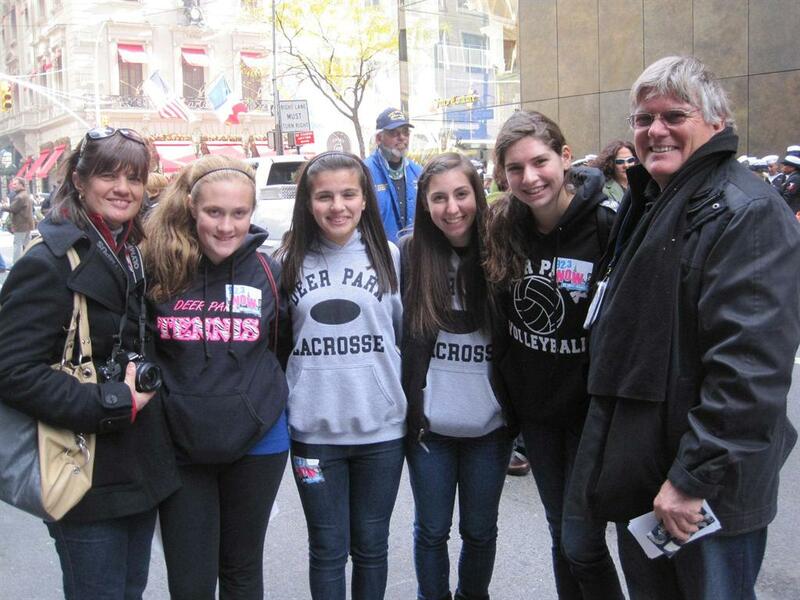 The Girl Scouts of Greater New York City executive team attended the Spirit of '45 Day kickoff announcement that was held in Times Square on August 14, 2009. 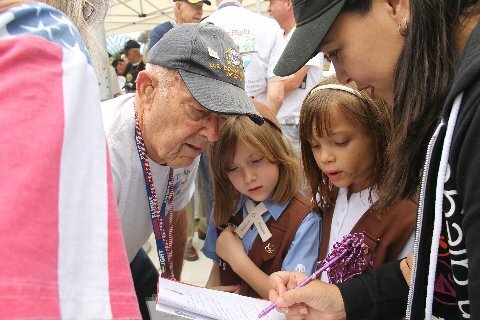 Girl Scouts from Chula Vista, CA, attended the rally on the USS Midway in January 2010 that launched the campaign to get Congress to unanimously pass Spirit of '45 Day, and participated in the first Spirit of '45 Day event at their local veterans home on August 14 of that year. 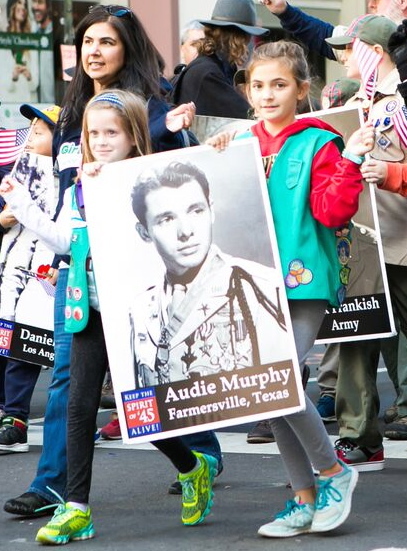 Girl Scouts were the first to volunteer for the annual Spirit of '45 Day Memorial Day March of WWII Gold Stars that has been central feature of the National Memorial Day Parade every year since 2009. 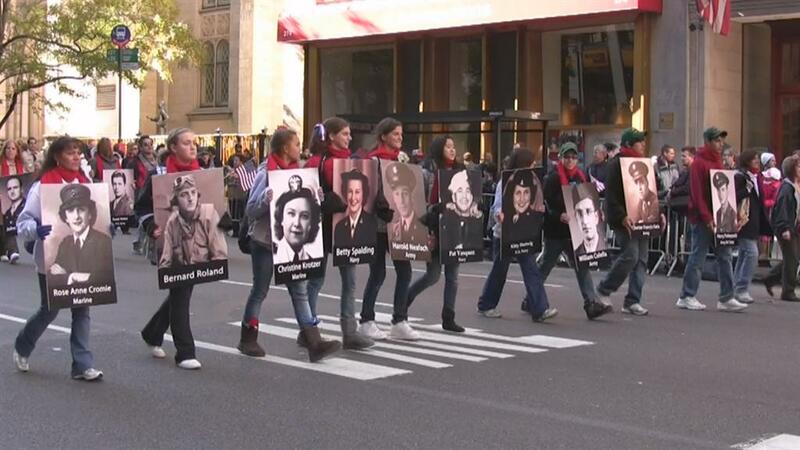 Girl Scouts were also among the first to organize Spirit of '45 entries in their local Veterans Day parades in New York City, San Diego, San Jose, and other cities. 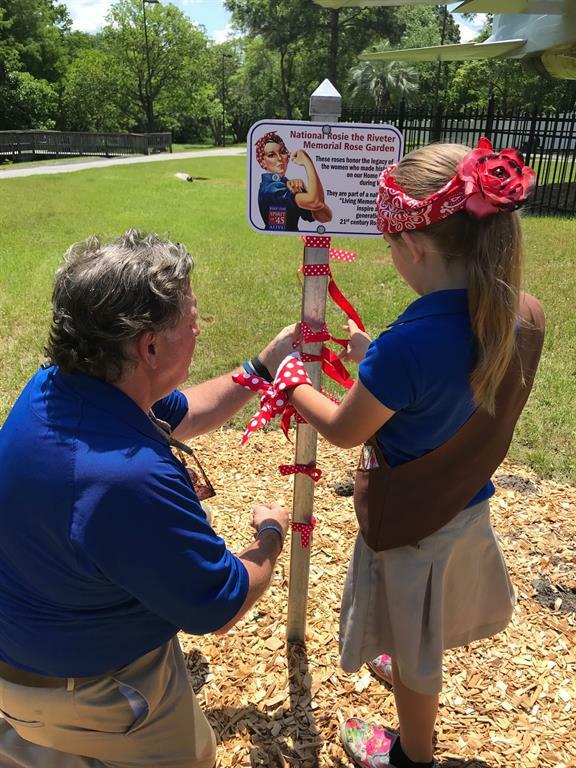 Girl Scouts troops were involved in planting the first generation of Rosie the Riveter Memorial Rose Gardens and have launched a campaign to establish Gardens at Girl Scout camps across the country. 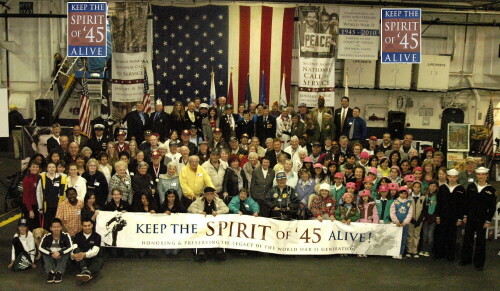 Girl Scouts parrticipated in the Spirit of '45 Day campaign kick off rally on the USS Midway in San Diego in January 2010 which led to Congress voting unanimously for a national Spirit of '45 Day to honor and preserve the legacy of the men and women of America's 'greatest generation," to be observed on the second weekend in August. 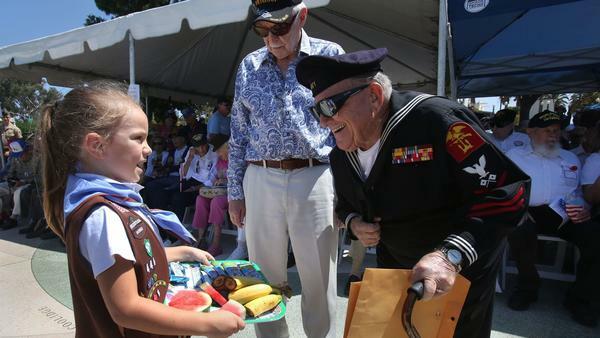 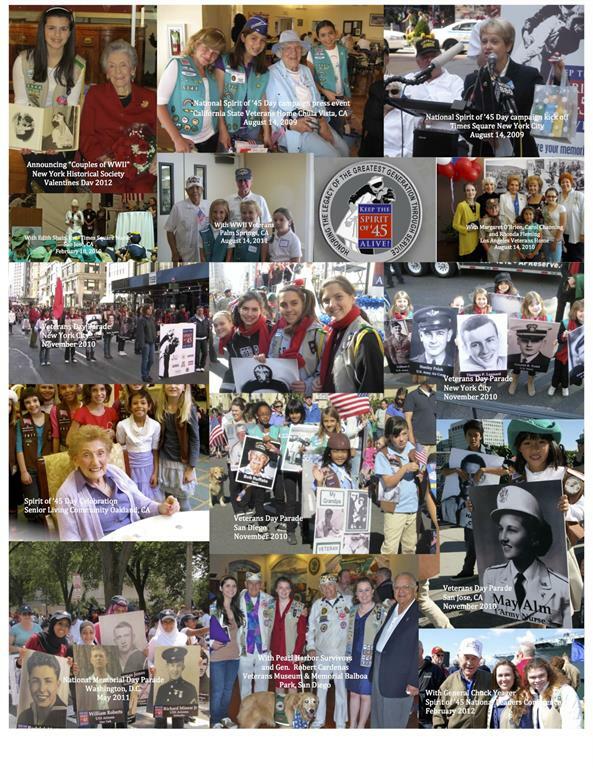 In 2009, Girl Scouts in Silicon Valley began carrying enlarged poster photos of members of the Greatest Generation from their community in the San Jose Veterans Day Parade. 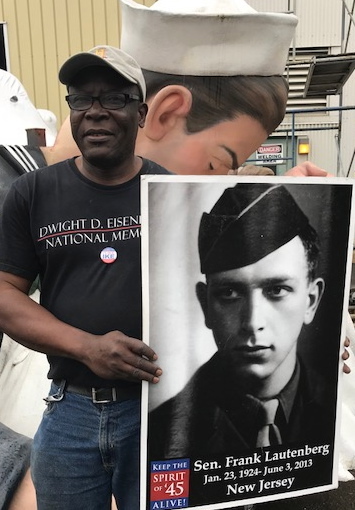 This idea has become a Spirit of '45 signature program and has inspired the annual Spirit of '45 Veterans Day March of WWII Heroes that is now being introduced to other parades across the country. 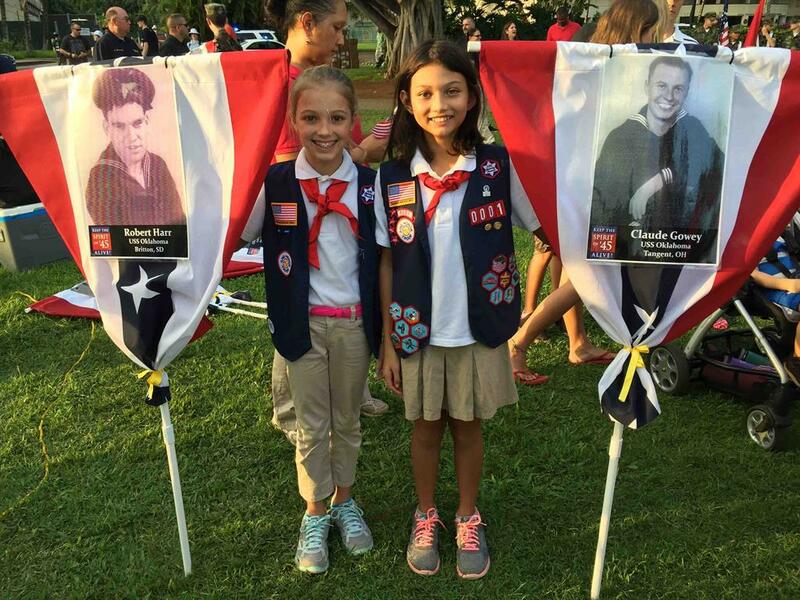 Girl Scouts in Hawaii carry photos of the American servicemen who lost their lives in the December 7, 1941 attack in the annual National Pearl Harbor Day Parade in Honolulu, a tradition that began in 2017 with the 75th Anniversary of Pearl Harbor Commemoration. 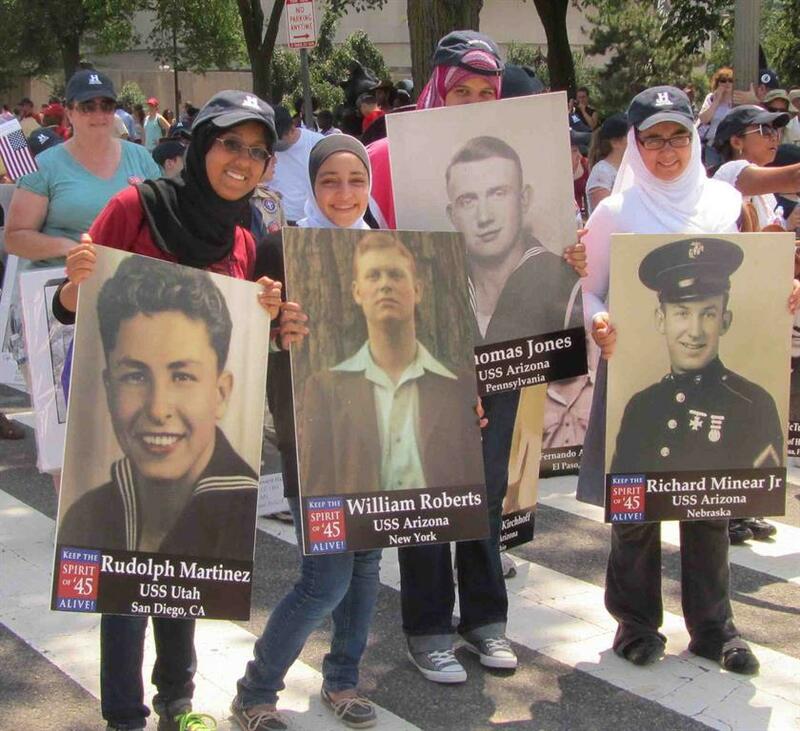 Muslim Girl Scouts carry photos of Pearl Harbor Gold Stars in the National Memorial Day Parade in Washington, D.C. which features an annual Spirit of '45 March of Heroes each year. 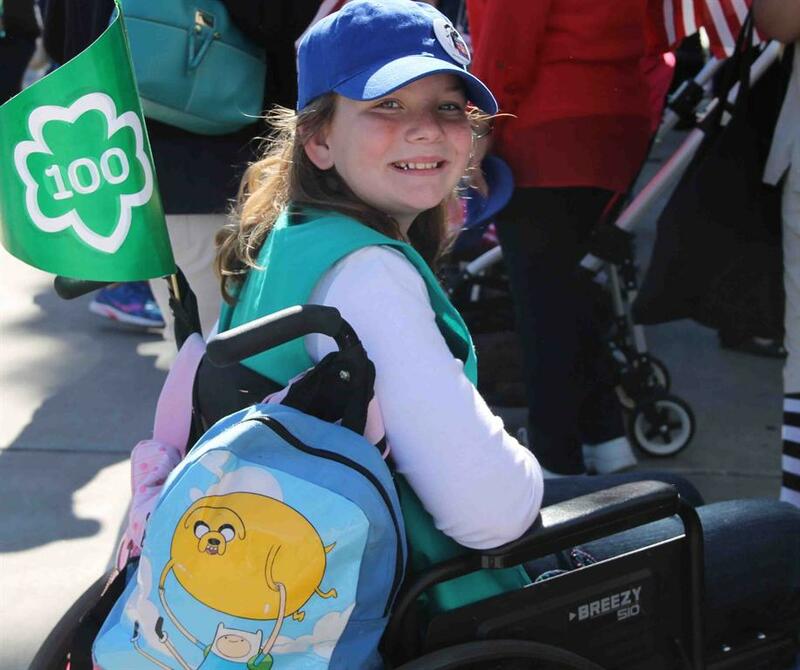 More than 200 Girl Scouts participate each year. 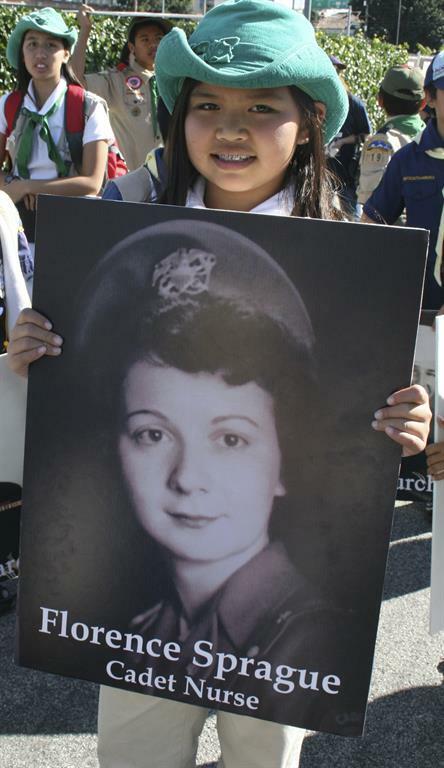 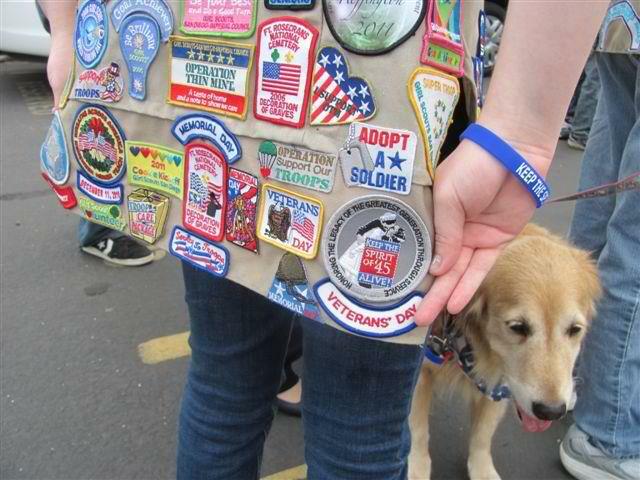 Girl Scout families have been the heart of the annual Spirit of '45 Memorial Day March of WWII Gold Stars since 2009. 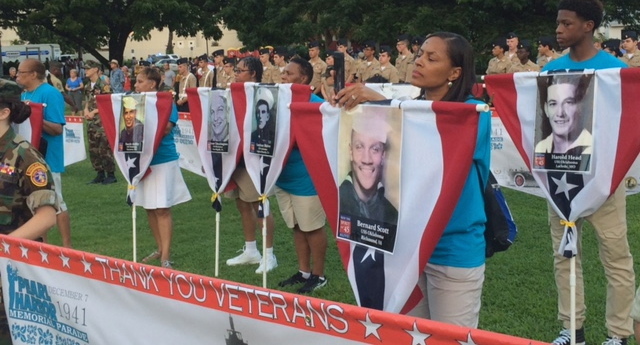 The program pays tribute to the more than 400,000 Americans who died serving the cause of freedom and democracy during World War II, and concludes each year with a special wreath laying ceremony in the National World War II Memorial. 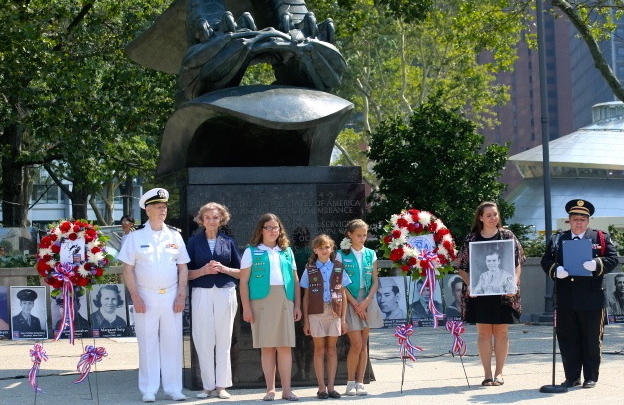 Girl Scouts participate in Spirit of '45 Day wreath laying ceremony at the East Coast WWII Memorial in New York City's Battery Park. 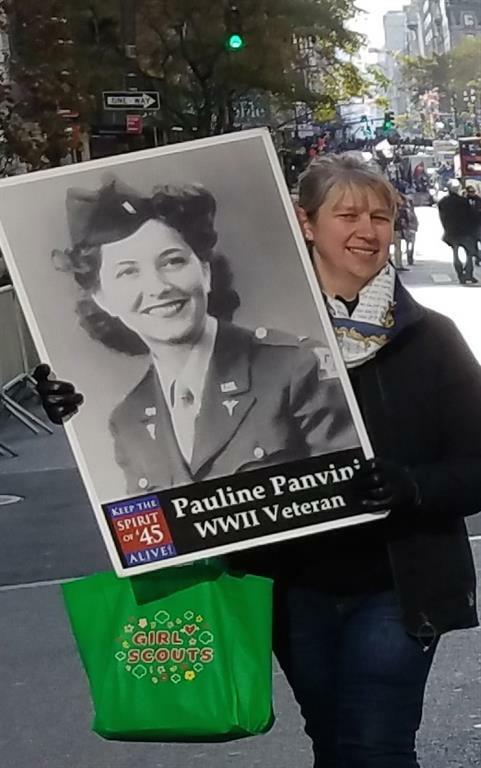 Girl Scout leader Val Pfundstein and her daughter led the Spirit of '45 youth recruitment effort in New York for several years, including supporting the annual Times Square event in August and organizing the Spirit of '45 entry in the NYC Veterans Day Parade. 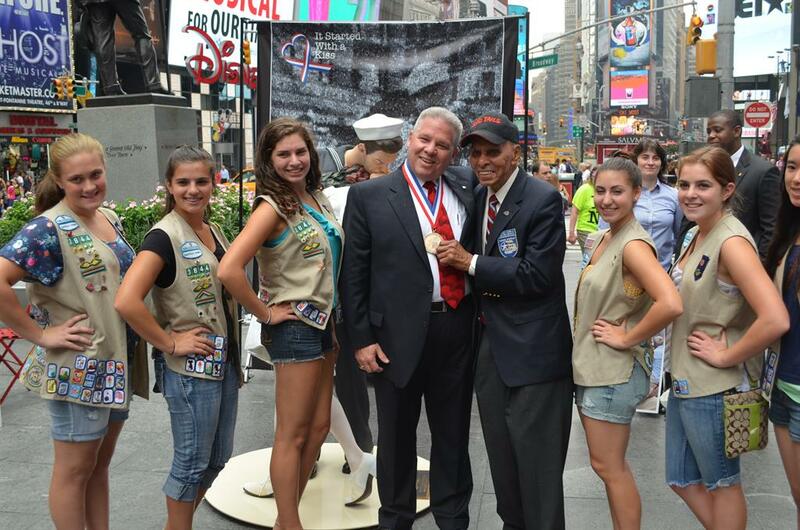 New York Girl Scouts join legendary Tuskegee Airman Dr. Roscoe C. Brown, Jr. as he presents the Spirit of '45 Day National Leadership Medal to Walgreens in Times Square in appreicaiton of its support. 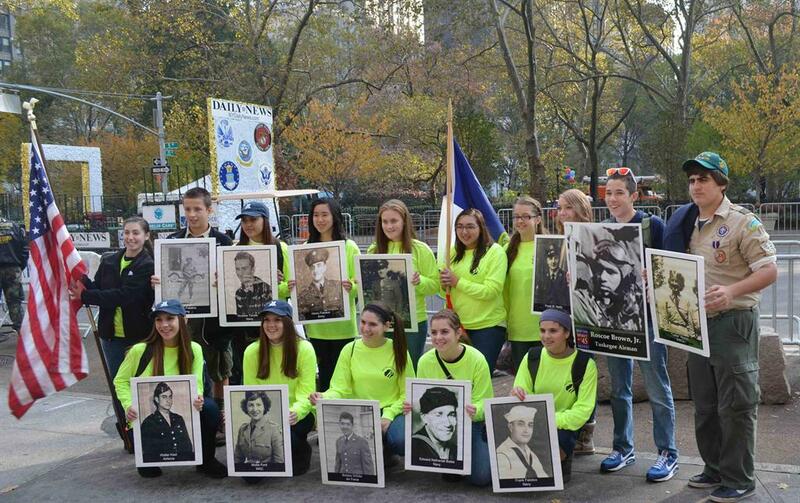 Senior Girl Scouts set the pace for Spirit of '45 March of WWII Heros entries in the New York City Veterans Day parade, the nation's largest, which has become a model for other Veterans Parades around the country as a way to continue to honor the WWII veterans in their communities and involve youth and families. 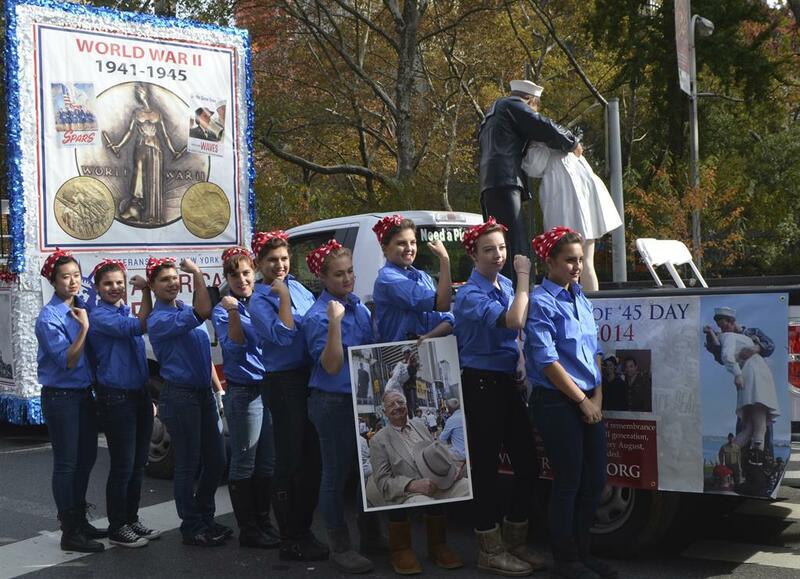 Val and her New York Girl Scouts introduced the idea of dressing up like Rosie the Riveter as a way to symbolize the Home Front support for the armed forces of the Greatest Generation, an idea that continues to be part of the annula Spirit of '45 entry in the NYC Veterans Day Parade and is now catching on in other parts of the country. 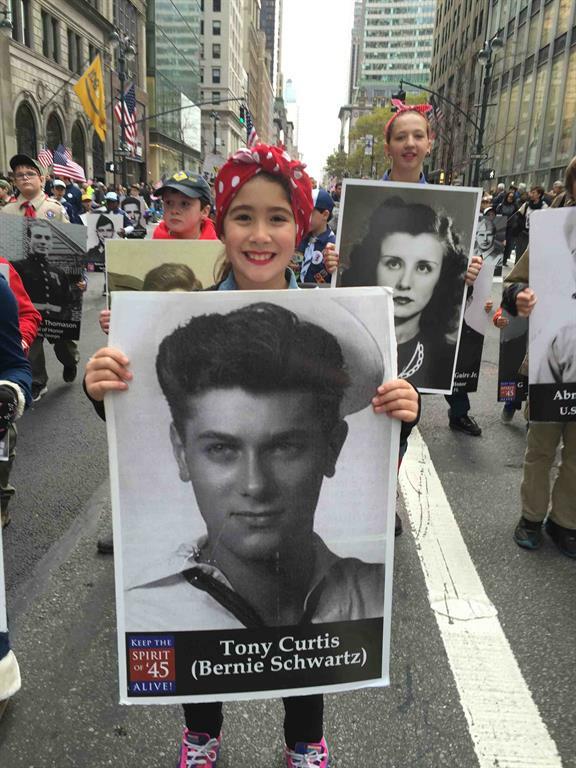 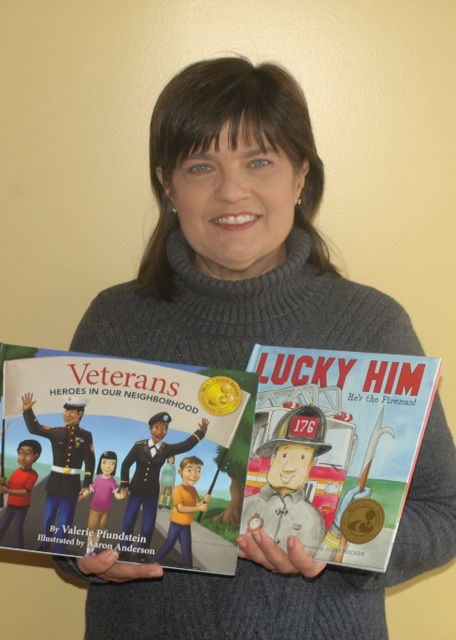 Following literally in Val's footsteps, hundreds of young girls now sign up each year to represent the Spirit of the WWII veterans - and the Rosies who supported them on the Home Front - in New York and other cities in America on Veterans Day. 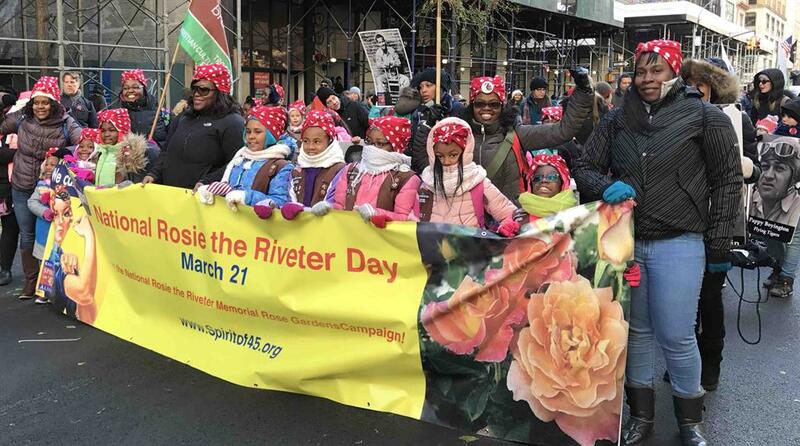 Girl Scouts are now promoting public awareness and participation in National Rosie the Riveter Day and the Rosie the Riveter Memorial Rose Gardens campaign by carrying banners in their Veterans Day parades. 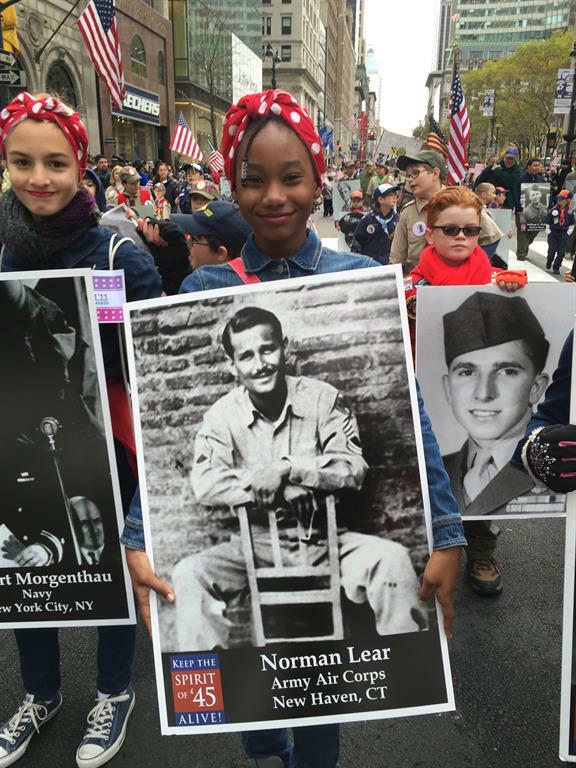 Girl Scout Troop leader Linda Lacomente (above with photo) is now coordinating the Spirit of '45 entry in the NYC Veterans Day Parade. 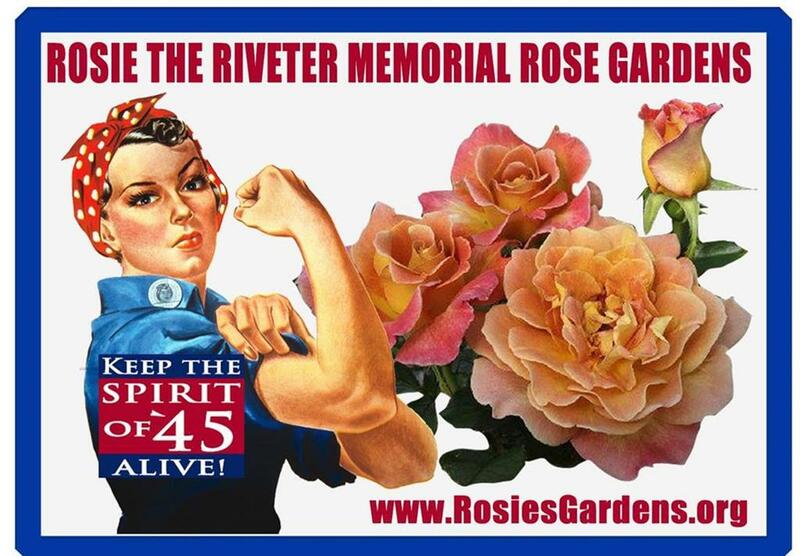 She and her Scouts organized the planting of New York's first Rosie the Riveter Memorial Rose Garden next to the East Coast WWII Memorial in Battery Park. 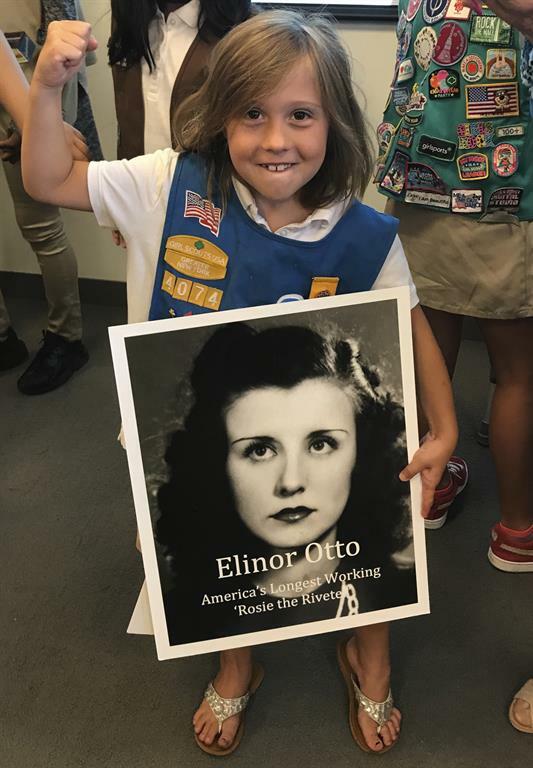 which was dedicated by Elinor Otto during a visit on June 1, 2018. 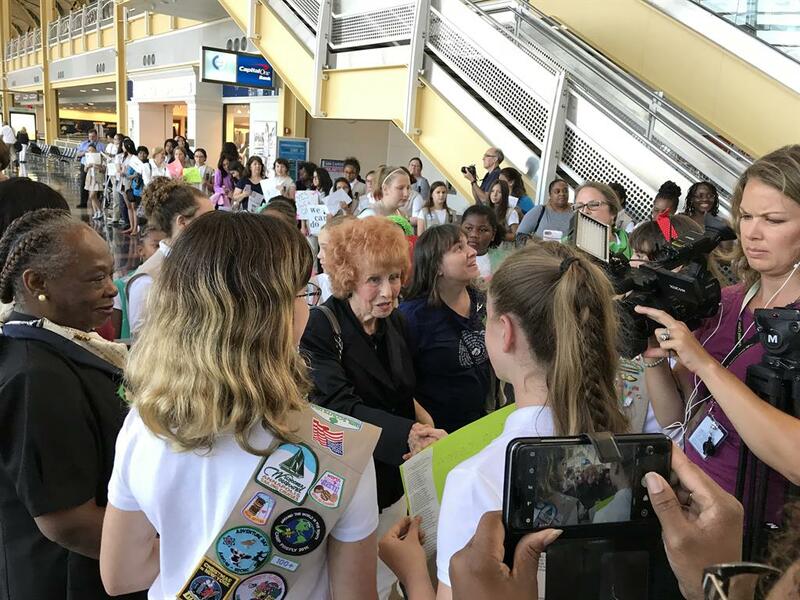 The event highlighted the theme of "Rosies Roses = STEMS" with a presentastion and information table encouraging Girl Scouts to excel in Science, Technology, Engineering, Math and Service to their community. 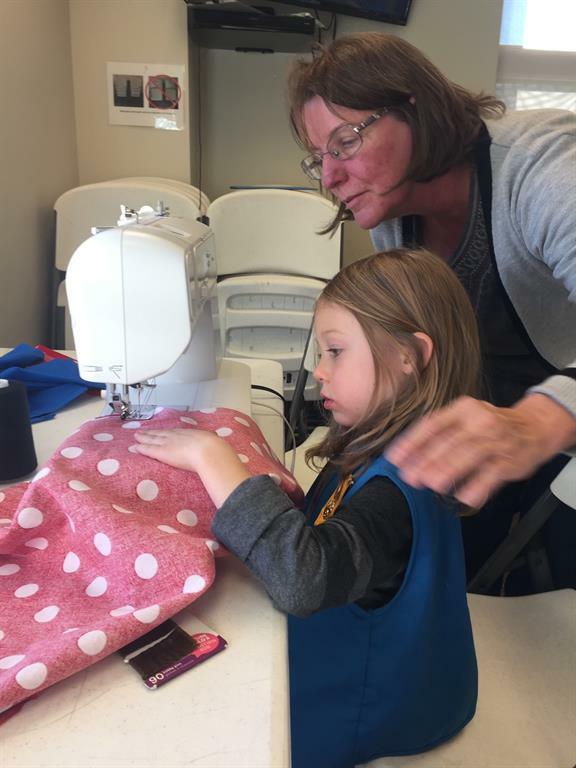 Girl Scouts in Durango, CO learn how to sew their Rosie bandanas that they will wear when they march in their local Veterans Day parade and dedicate their Rosie the Riveter Memorial Rose Garden. 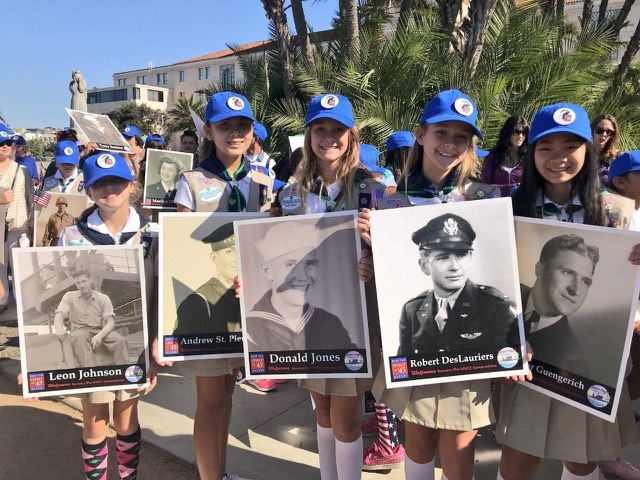 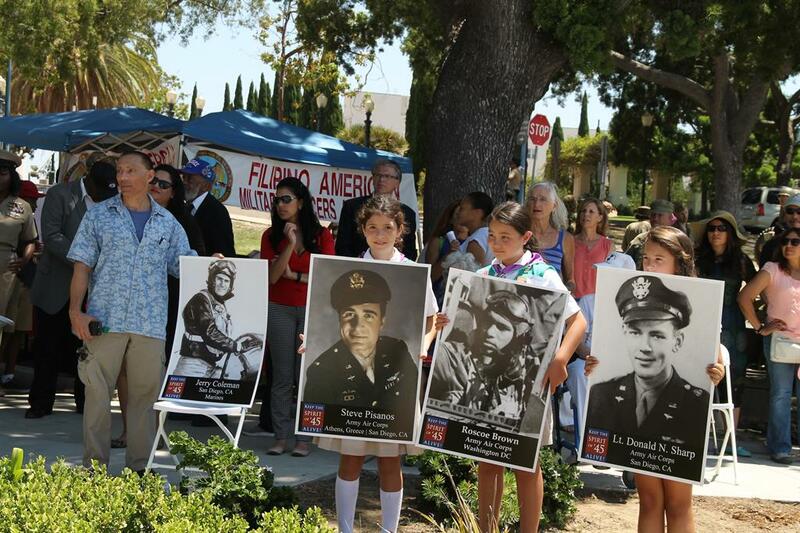 More than 100 Girl Scouts in San Diego march each year in their local Veterans Day Parade with photos of Honor Flight WWII veterans, donated by their local Walgreens store. 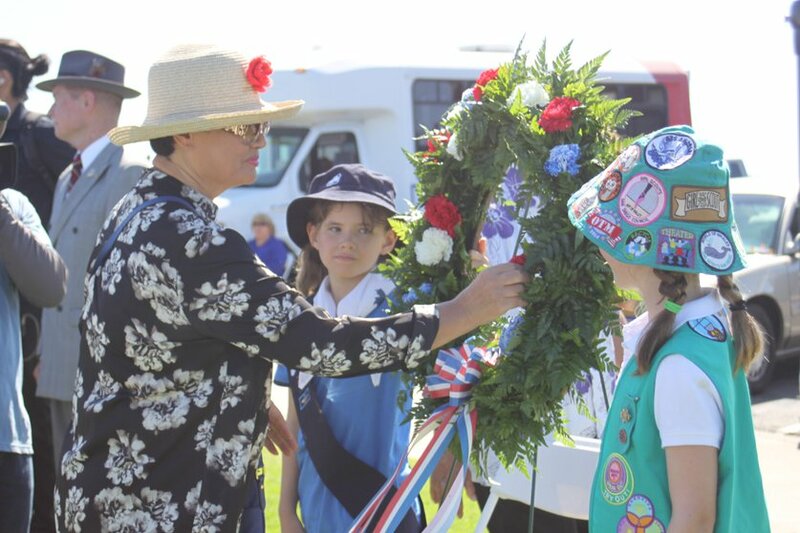 San Diego Girl Scouts also take part in the popular Spirit of '45 Day community event that is held each year in Balboa Park, and participated in the 2015 round the world wreath laying that concluded the Spirit of '45 WWII 70th Anniversary Commemorative Weekend in 2015. 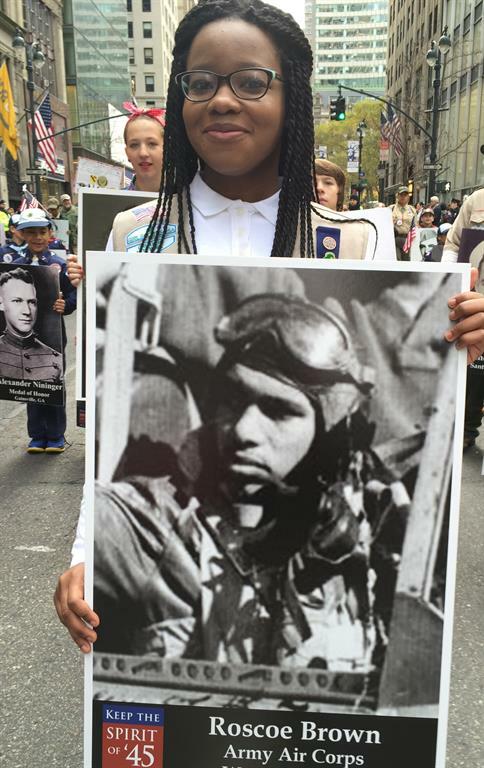 Youth volunteers from the Girl Scouts of Washington, DC Sudden Service program and children of Chinese Embassy staff present Doolittle Raiders Wall of Honor at the inaugural wreath laying ceremony held at the Air Force Memorial on April 18, 2017 to mark the 75th Anniversary of the Doolittle Raid. 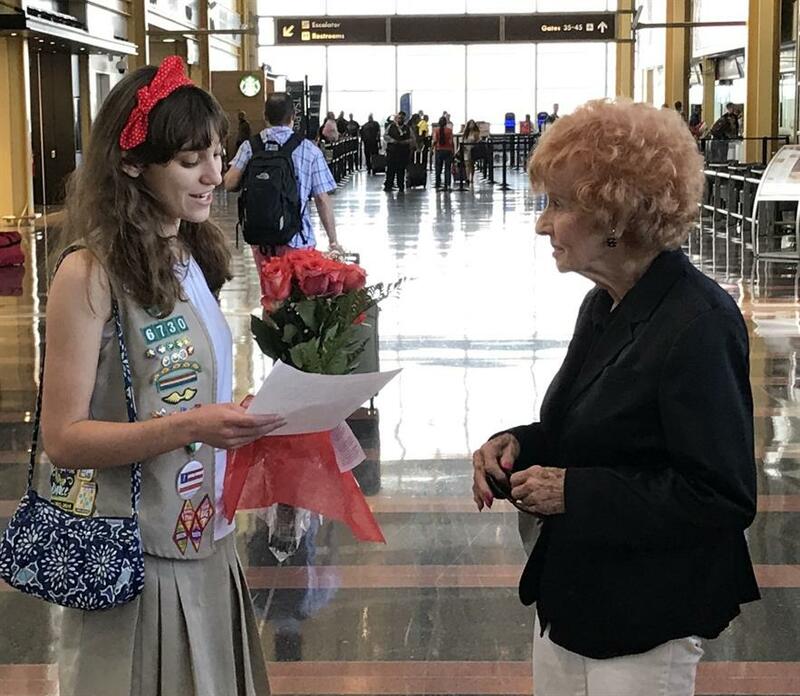 Madeleine LeBeau, a Girl Scout Gold Award recipient, has been active in Spirit of '45 for more than 5 years. 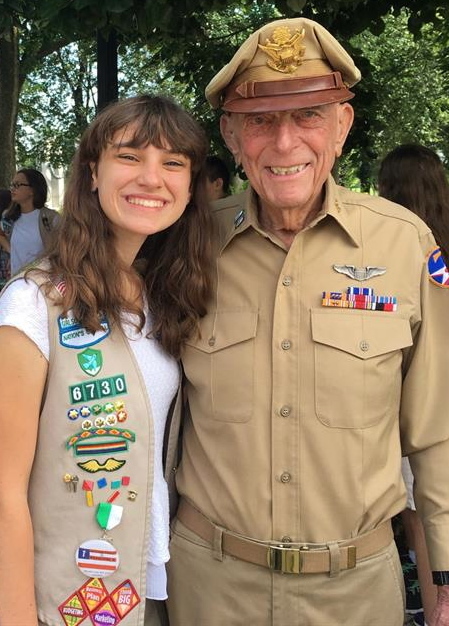 Madeleine organized a Spirit of '45 Day ceremony at the National WWII Memorial on August 14, 2017, featuring the late Capt. 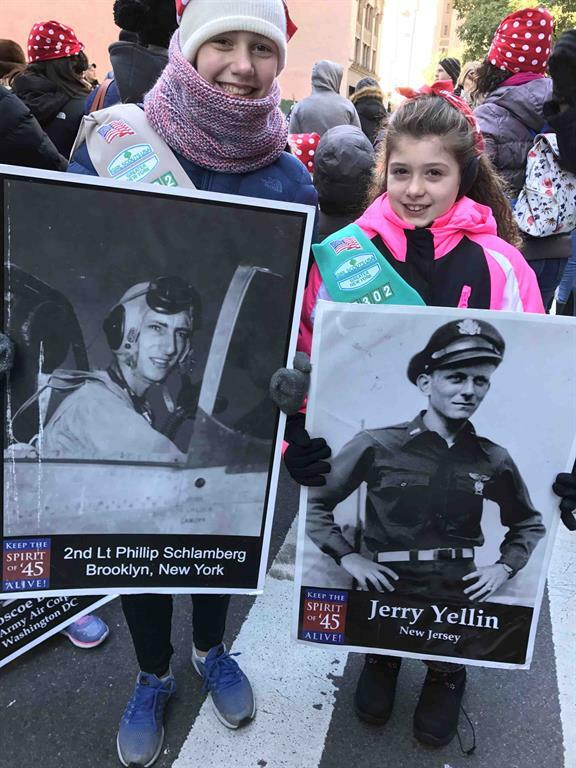 Jerry Yellin, that was attended by more than 100 Girl Scouts. 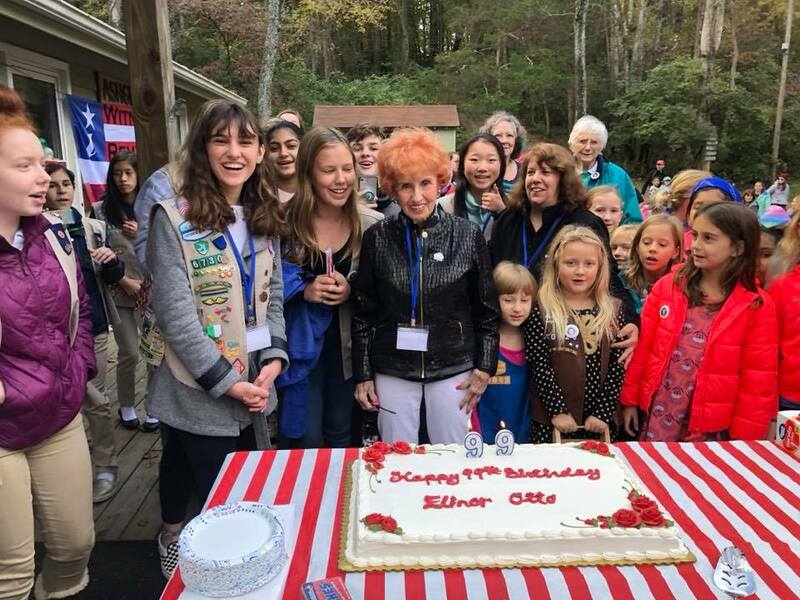 Madeleine organized a welcome for Spirit of '45 Day spokeswoman Elinor Otto, when she came to Washington, D.C. in September 2017 to receive a life time achievement award from the Air Force Association on the 70th anniversary of the formation of the U.S. Air Force. 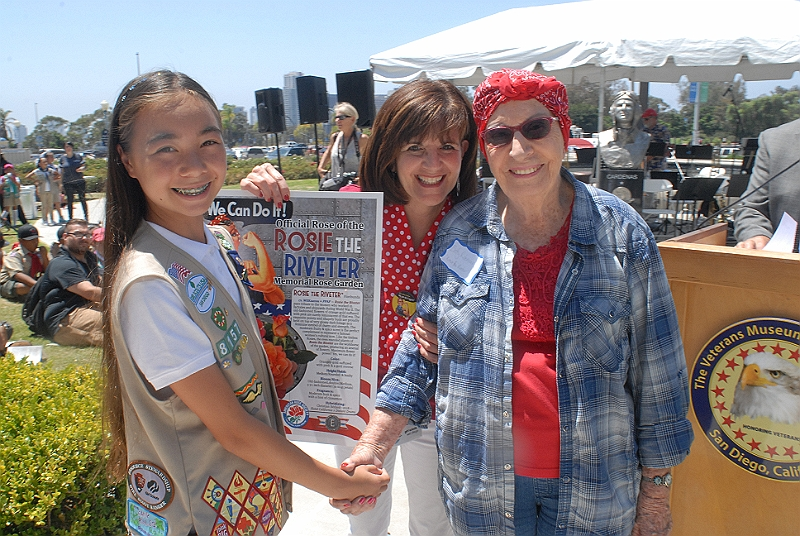 On March 21, 2018, Madeline represented the Girl Scouts of the Nation's Capitol at a Capitol Hill reception on National Rosie the Riveter Day, where she met California Congresswoman Jackie Speire, who has co-sponsored bicameral bipartisan legislation for a Rosie the Riveter Congressional Gold Medal. 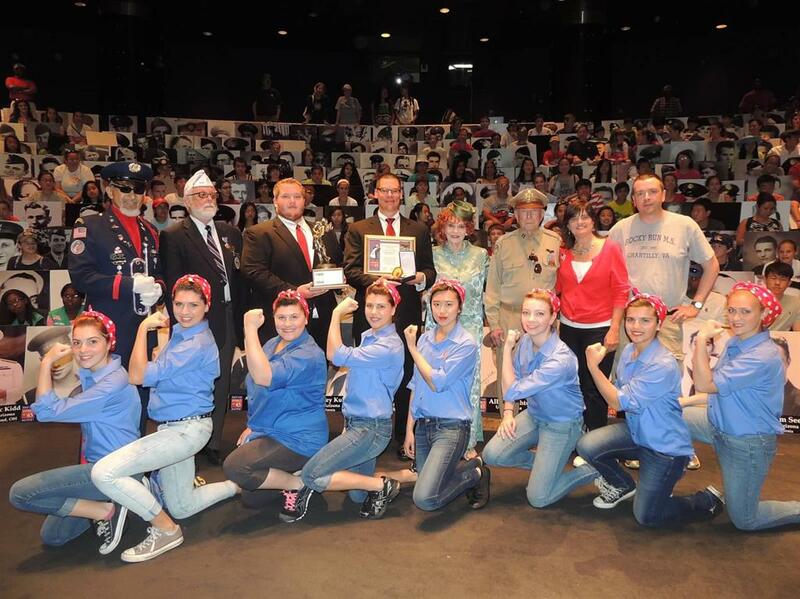 Madeleine organized the 2018 Spirit of 45 Memorial Day program at the Air Force Memorial, and recruited hundreds of youth to participate in the Spirit of '45 Memorial Day March of Heroes. 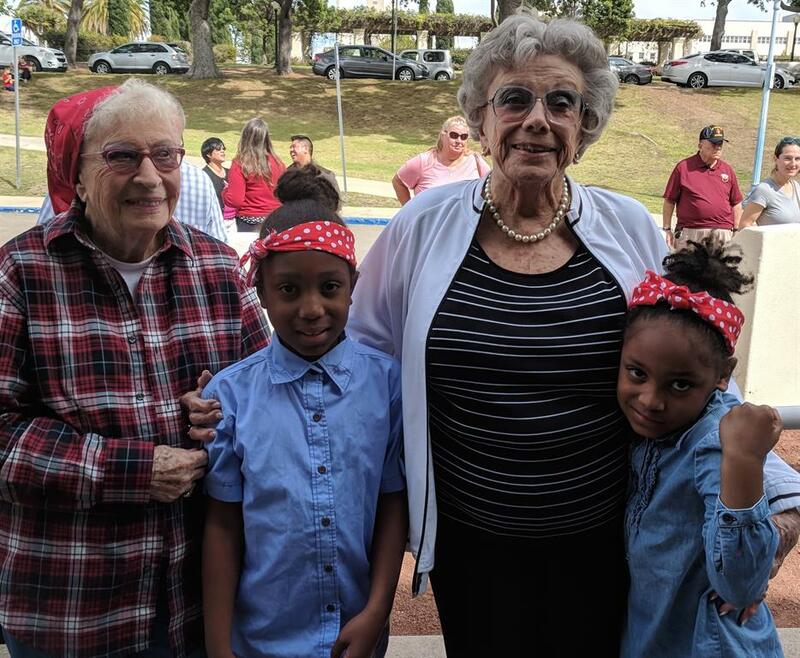 Madeleine organized a dedication ceremony on October 28, 2018, for Virginia's first Rosie the Riveter Memorial Rose Garden, which was attended by Elinor Otto - aka "America's Longest Working Rosie the Riveter" who was celebrating her 99th birthday that day. 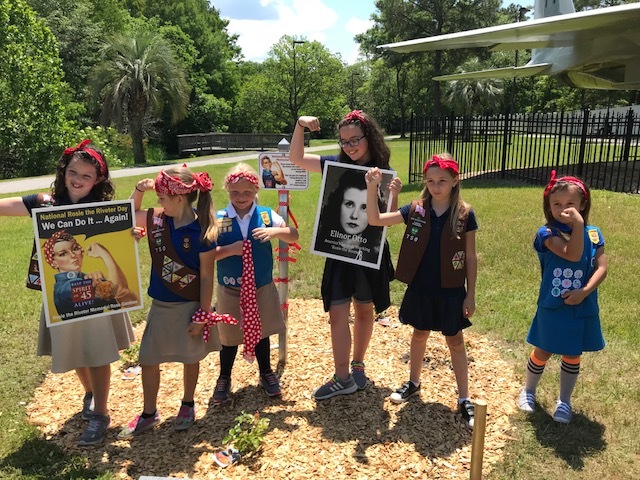 Girl Scouts came out to help dedicate a Rosie the Riveter Memorial Rose Garden that was planted by the Air Force Association in the Veterans Memorial Park in Callaway, FL. 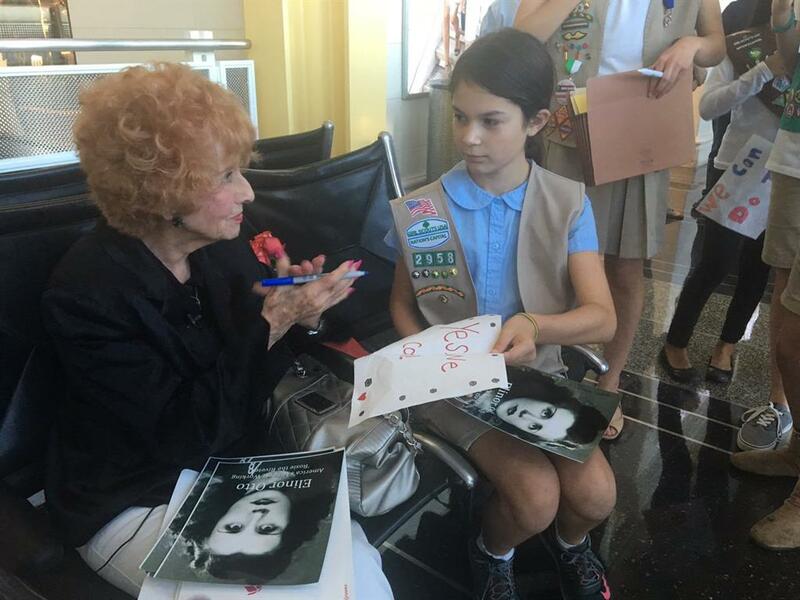 Girl Scout welcomes Elinor Otto to a Memorial Day Rosie Rally at the Glenn L. Martin Aviation Museum in Baltimore. 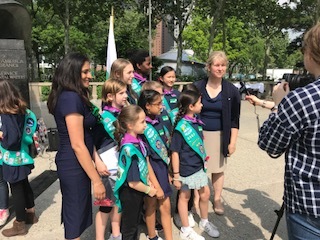 Girl Scouts and senior executives hosted America's Longest Working Rosie Elinor Otto when she visited Chicago and New York City to promote interest in Spirit of '45 and the Rosie the Riveter Memorial Rose Gardens campaign.